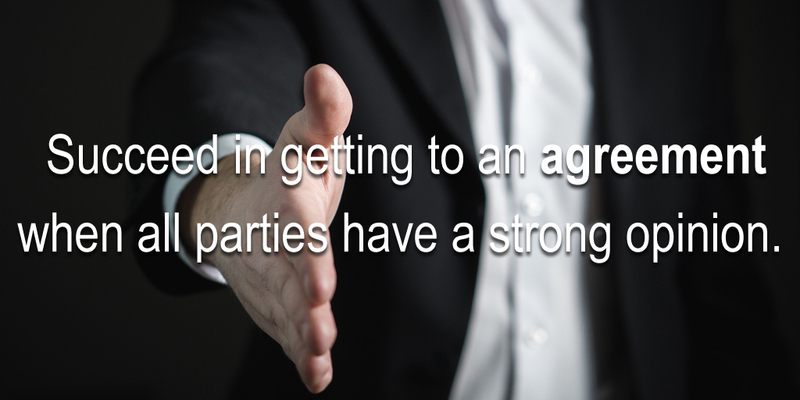 Succeed in getting to an agreement when all parties have a strong opinion. We’ve probably all experienced it–many times. Different parties trying to convince each other, without success. Endless debates. People not feeling heard. Usually it ends with frustration. The hierarchical leader takes a decision that is not shared by the others. Or there is no decision, and the situation lingers on, leading to even more irritation. Let’s take the example of Fred who has difficult interactions with his colleagues of the executive committee. He needs their precious cooperation for one of his projects and is disappointed in the support he receives from them. As he absolutely needs a solution, Fred has endless discussions with them. He only sees confirmation of his conviction: “I’m right and they are wrong” (and they are so stupid for being so wrong). With such a belief, no wonder the discussions so far have been pure ‘power games’. When trying somewhat harder to take the perspective of the other party Fred still finds it difficult to understand his colleagues. Yes, he realizes they are scarce on resources themselves, and that they have their own objectives to realize. So he grasps it isn’t easy for them to provide all the support Fred needs. But to Fred these reasons are not sufficient: “My projects are exactly what we need to prepare the future of our company. That is so obvious!” That’s where he makes a second typical shortcut: “I want the best for all. They are so short-sighted”. As long as Fred believes he’s the only one with good intent, of course they won’t succeed in having a productive conversation together. No wonder they don’t come to an agreement. So Fred decides to discuss aspirations and ambitions with his colleagues. He soon realizes they all want the same: success for the company and good collaboration between the different departments. This definitely brings them closer together. But there’s not yet a solution. Even though Fred now trusts his colleagues somewhat more on their positive intent, and even if he acknowledges some of the difficulties they encounter, he doesn’t want to budge. In his mind, he has already given up so much. He has been patient, he has sacrificed, he has put up with so much stuff. For him it’s clear: “Now I will have it my way. They always have it their way”. A complete blockage. Reality is his colleagues also think they have done their part, and it’s time for them to get something back. So some negotiation is necessary. Fred reflects how better to take into account the concerns of his colleagues AND turn the situation into an opportunity for all. When his colleagues notice his willingness to find win-win solutions, the entire dynamic changes and they start proposing constructive solutions as well. The support Fred receives in the end is different from what he initially asked. But the agreed solution is one where all parties involved make significantly more progress towards the shared objectives. With a bonus: increased appreciation and trust. “Could it be I consider I want the best for all, and the others are short-sighted?” If yes, have a discussion with the other party on their overall aspirations and ambitions. “Could it be I don’t want to budge because I consider I’ve done enough already?” If yes, reflect how you could give in on some elements AND leverage the situation. Contact us if you need help in crafting alignment or in creating a more cohesive team.